To the ordinary superstitious person, a horseshoe with the ends pointing up, is viewed as good luck. These can ususally be found tacked up above a doorway and kept as a talisman. The claim is that the luck stays in the horseshoe and is bestowed on the owner. Conversely, some believe that if the horseshoe has the ends pointing down, the good luck will drain from the shoe and be bestowed on those around it. In gravestone art, however, the horseshoe is a symbol that wards off evil, not as a good luck charm. The horseshoe can also be found on the graves of people who had a strong passion for horses or even those who had worked with horses, such as trainers, jockeys, horse owners, or just those who loved to ride. However, if you are not a football fan, you might have missed the meaning of what this particular horseshoe represents. 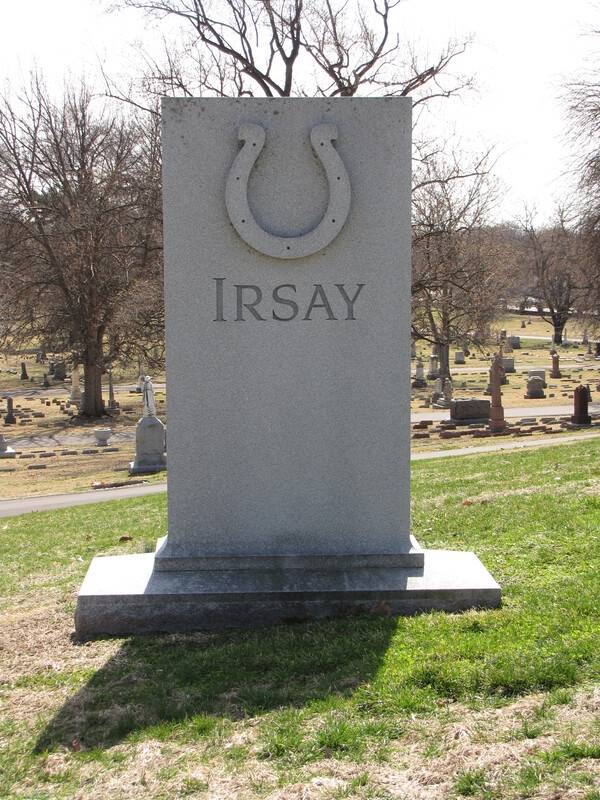 This steele with the prominent horseshoe, ends up, is the gravestone of Robert Irsay, who was born March 5, 1923 and who died January 14, 1997. Mr. Irsay purchased the Baltimore Colts and moved the team to Indianapolis in the wee hours of the morning on March 28, 1984. The move of the team made Robert Irsay a dispised figure in Baltimore and beloved in Indy. This horseshoe with the ends up and 7 nail holes, most likely a lucky 7, is the symbol of the Indianapolis Colt’s team and can be seen on their helmets, team paraphenalia, and if you look closely, on the belt buckles of the cheerleaders’ uniforms. I knew about the Colts moving in the night from Baltimore to Indy but not the symbolism.